Spring skin care is a must for soft skin, its vital that during this transitional period we prepare ourselves for this sudden change in climate to help avoid any unwanted blemishes or dryness. 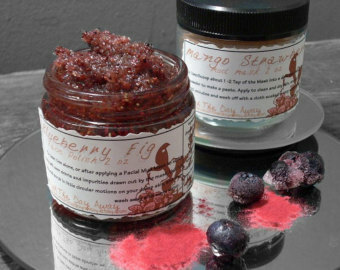 Today we have a fantastic home made recipe to help you exfoliate in preparation for these crisp, sun laden mornings. Seasonal skin care during spring is especially important. For the next several months more of your skin will be seen than at any other time of year! Try these great spring skin care tips and recipes for healthy, beautiful skin. Massage the mixture onto your body using circular motions towards the heart. Leave the scrub on for a few minutes to let it absorb a little, rinse off thoroughly with warm water, then do a quick rinse with cold water to increase circulation. More spring skin tips all week here at beauty natural, Why not try this today and get yourself looking great and feeling beautiful ! Spring is definitely on the way, the daffodils are out and the grim, wet, cold days will soon be nothing but a distant memory – or so we hope. As we plan our new wardrobe equipped for the change in weather, be sure not to leave your skin in the cold this spring. As the climate changes it can play havoc with our skin, but rest assured here at Beauty Naturale we have all the tips to help you stay beautiful and feeling great. Whether its to help tackle dry, scaly, rough, spots on heels, knees, and elbows or overheated, undernourished skin on your face and body all this week we will have the best professional insider advise, tips and treatments. “Nothing is worse for skin than a long, cold winter — the low humidity in conjunction with hot air, heat, and less fresh air often can leave your skin looking dull, dry, rough, and even wrinkled and older,” says Cheryl Citron, MD, the past president of the New Jersey Dermatology Society. Knees, elbows, heels, and toes can also suffer from a winter in boots — where too often, says Citron, what we don’t see, we neglect. “When our feet and legs aren’t on display the way they are during warmer weather, we tend not to moisturise as much, and we don’t pay as much attention to things like dry cuticles; unfortunately, it doesn’t take long for skin that is neglected to react, becoming dry, dull, and flaky, and sometimes even red and inflamed,” Citron tells WebMD. The good news: Beautiful, summer-sweet skin is closer than the nearest watermelon patch! The best place to start, say experts, is with a head-to-toe moisture treatment — and you don’t need high-priced products to do the job right. “One of the best moisturisers you can use is white petroleum jelly — particularly on the very roughest, toughest areas of skin, such as heels, elbows, and knees,” says Heidi Waldorf, MD, director of dermatologic laser surgery at Mt. Sinai Medical Center in New York City. And if you’ve ever heard that old wives’ tale about drenching feet in Vaseline and then donning a pair of white cotton socks — well, Waldorf says it’s not a myth and it really can dramatically change the way your feet look and feel, almost overnight. “If you don’t like sleeping in socks, then just smear on the petroleum jelly right before you put on your gym socks and sneakers before working out, or even just to run errands,” she says. If hands are in equal need of a spring makeover, coat them with petroleum jelly as well, and then don a pair of white cotton gloves. “Any time you are doing a household or garden chore that requires you to wear rubber gloves or gardening gloves, put on the petroleum jelly first, then the white gloves, then the rubber gloves over that,” Waldorf tells WebMD. By the time your chores are done, she says, you’ve given your hands a pretty terrific beauty treatment. For more great advise on skin care be sure to follow us on facebook, twitter and our blog. Coming up later this week home recipes you can make to impress yourself and our friends.